3 steps. 30 minutes. Best skin ever. This summer I started an internship at Rejuvenation Medspa. My specific internship title is “Social Media intern”. Of course being a woman, I found all the treatments in Aesthetics interesting and wanted to learn all about them. However, being 20, I knew it wasn’t time for me to start most of the options offered here. But, only a few days into my new job did I realized how important taking care of your skin is. I wanted to begin a skin care routine or find something I could do now to help keep my skin young and healthy. This past Monday at work we learned all about the Hydrafacial, a new treatment being offered at the office. I recently heard amazing things about the treatment via the internet but after seeing the results first hand, I knew this was the perfect option for me. 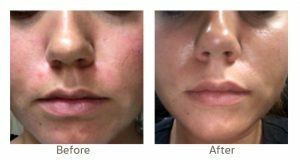 The Hydrafacial has components that appeal to those of all ages and skin types. Personally, I had been facing troubles with minimal acne scars, blackheads, and occasional breakouts. I just knew I had to jump on this opportunity that day! I couldn’t wait to try it. The first step is exfoliation and I could actually feel my pores opening and fresh skin becoming present. The extraction step removes any blackheads or unwanted debris clogged in the skin. This is not painful, and after the treatment, you will get to see what was extracted in a clear tube. For me, this was interesting as you get a glimpse of what was trapped underneath your skin. After the treatment, I glimpsed into the mirror and to my surprise, I noticed a difference immediately. My pores were a lot smaller specifically around the nose area, and my skin was glowing! WOW did my skin feel great. It was smooth, hydrated, and felt extremely clean and refreshed. About 5 hours after the treatment, I was getting ready to head to my boyfriend’s house. As I was putting on my makeup I noticed how easy my foundation flowed over my skin, looking as if it was airbrushed. When I walked into his house, he immediately said “Wow, what did you do differently to your skin? You are like…glowing!” Also, I’m surprised that a guy noticed the difference in my skin after only one treatment. LOL. I am in LOVE with the Hydrafacial and I am so excited to add it into my skin routine! We now offer reduced pricing for a monthly membership, or the option to purchase a single visit. After picture was taken 2 days post-treatment.